Fast data is real-time data that typically comes in from streaming and is analyzed quickly to make rapid business decisions. View the Forrester infographic, The Future Of Data, Make It Fast. In a recent study by Forrester¹, more than 75 percent of companies surveyed already use fast data solutions. 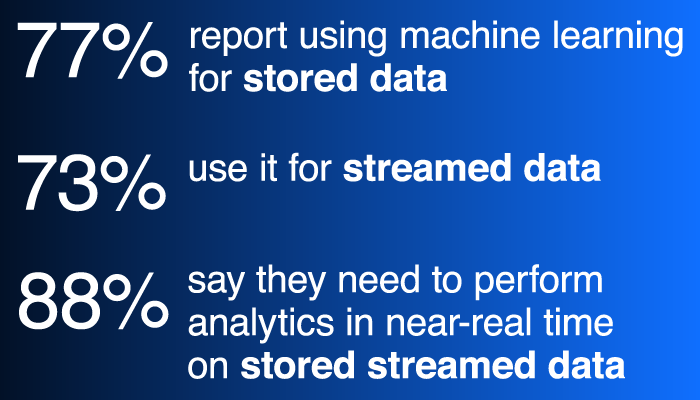 Of those surveyed, 88 percent indicated they need to perform analytics in near real-time on stored streamed data. IBM provides a real-time database for fast data, with built in real-time analytics and machine-learning tools for concurrent analysis of real-time and historical data. Now, with the IBM Fast Data Platform you can design, build and run streaming applications with agility and efficiency. View the 3-minute video to learn more. Get an optimized in-memory HTAP database with open data format for sharing and integrated event data management with access to Apache Spark Streaming, Spark Analytics, IBM Streams, Kafka, Scala, Java™, IBM Big SQL and Python. Apply built-in machine learning and data science capabilities to enable smarter responses in event-driven applications. IBM’s fast data capabilities support real-time, scalable analytics on both incoming and historical data. Capture, store and analyze more than 250 billion events per day with three nodes. This high-performance capability scales linearly with additional nodes — and is delivered with high availability that supports real-time access. The Lightbend Fast Data Platform and IBM Db2® Event Store enable a new era of event-driven business insight and opportunity, while reducing complexity. IBM and IBM Business Parner® Lightbend have designed joint solutions that provide a complete tool chain for Java and Scala developers to easily build and deploy AI and cognitive applications in on-premises and cloud environments. Db2 Event Store is an in-memory database designed for massive ingestion of event data while performing real-time analytics. Optimized for event-driven data processing and featuring built-in analytics, Db2 Event Store supports applications like IoT solutions, payments, logistics and web commerce. It’s flexible and scalable and can adapt quickly to changing business needs over time. Db2 Event Store includes data-science tools and machine-learning integration. Install Db2 Event Store Enterprise Edition on an enterprise-grade Linux single node or cluster (three nodes). Ingest and query millions of events per second. Take advantage of data science tools for building in machine-learning, a monitoring console and the capability to write to object storage. Develop applications with a Scala, Python or REST interface using notebooks, or by way of a direct connection to Db2 Event Store. Install Db2 Event Store Developer Edition on a Mac, Windows or Linux machine. Ingest and query up to 100,000 inserts per second. Db2 Event Store accelerates queries with Spark enhancements and an index. Application development uses notebooks or a direct connection to Db2 Event Store. Db2 Event Store Developer Edition includes data-science tools and machine-learning integration. IBM Fast Data Platform is a complete environment to quickly develop, deploy and monitor streaming analytics solutions that incorporate microservices, streaming engines, a real-time database with analytics and open data format, and modeling tools for machine learning. It includes Lightbend Fast Data Platform, Db2 Event Store, and IBM Watson® Studio. It’s security-rich, integrated and fully supported. See a quick view of study results on the use of machine learning on streamed and stored fast data and the cost of data delays. You’re probably wasting time and money on stale insights. Use the Forrester framework to classify insights by “perishability” and learn how to apply them while they’re still relevant, in real time, or for operational, performance or strategic decisions. In this webinar, Forrester and IBM representatives discuss the business and technology factors that are inspiring a new generation of event-driven business applications. See why speedy insight is essential — and how to achieve it. 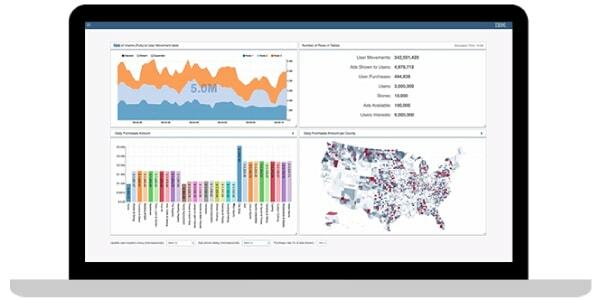 See how a retail business can use Db2 Event Store and the embedded IBM Data Science Experience tool to visualize and the embedded IBM Watson® Studio tool to visualize and understand customer behavior from click stream data, such as page views and time-on-page. TheCUBE interviews IBM Fellow Namik Hrle on the value of fast data and how Db2 Event Store can help. Db2 Event Store can ingest and analyze 250 billion events per day. Read how integrated machine learning and data science enable smarter responses. Schedule a free 30-minute consultation with an IBM advisor, who has the expertise to help you choose the best option to meet your technology needs.